Trams may be the Paris region's best-kept transportation secret, at least for visitors from abroad. Paris and its environs now have four modern tram lines--including one in the city itself, the T3 line, which runs along the southern edge of Paris from the Pont du Garigliano (on the Seine in the 15th arrondissement) to the Porte d'Ivry Métro station (at the eastern edge of the 13th, a few blocks from the suburb of Ivry-sur-Seine). The €310 million tramway opened in December, 2006, bringing streetcars back to Paris for the first time in nearly 70 years. ABOVE: Like many of Europe's newest tramways and LRT lines, Ligne 3 has sections of dedicated right-of-way with grass surrounding the rails. INSET BELOW: A No. 3 tram on a Parisian street. As a tourist, you probably won't use the trams frequently (if at all), but the T3 line might be useful when you're in the southern part of the city and need to get from east to west or vice versa. And the trams are worth seeing if you're interested in public transit or urban design. In the large photo above, you'll witness a distinguishing feature of the T3 line: a right-of-way that looks more like a strip of parkland than a transit route. 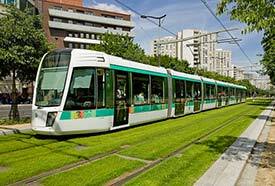 The grassy strip with tracks is typical of Europe's newest tramways and LRT (Light Rail Transit) lines, such as those in Bordeaux and Porto, where groundskeepers often work alongside track-maintenance crews in outlying neighborhoods and suburbs. Paris trams run from early morning until late evening. During the day, intervals between trams are normally 5 to 7 minutes. Buy tickets from automated machines on the platforms, or use any of the RATP tickets and passes that are valid on the Paris Métro and public buses. Be sure to stamp your ticket in the validating machine when boarding the tram. You can connect free between RATP city buses and trams on every line except the T4 line, which is run by SNCF (the French national railways). The state-of-the-art trams are designed for easy access by mobility-impaired passengers, including travelers in wheelchairs. Inset photo copyright © Michele Lugaresi.